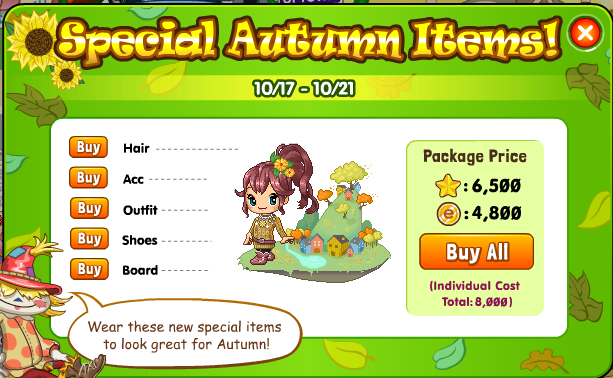 Everything in Fantage is Autumn now! 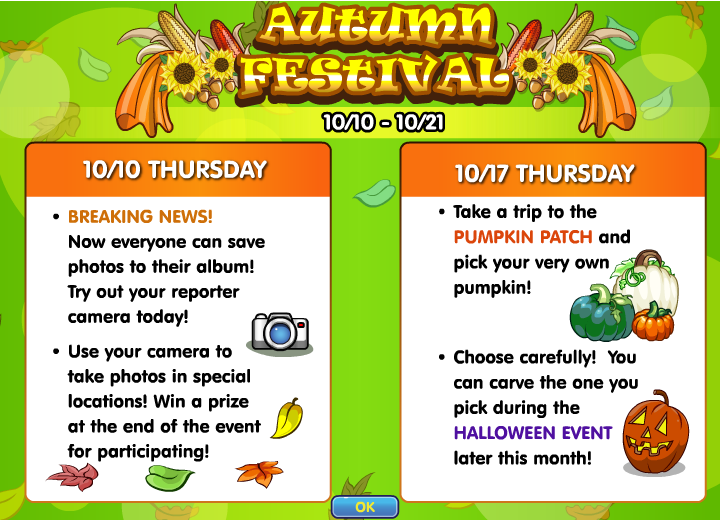 Take a walk around, the trees are golden and lovely, the leaves are falling… And Fantage has released a new party, “Autumn Festival”. Everyone can take pictures and have a photo album in their homes now! You can find the button to take some pictures in the upper right hand corner near the daily quiz and stuffs. To view your pictures, just go to your house. 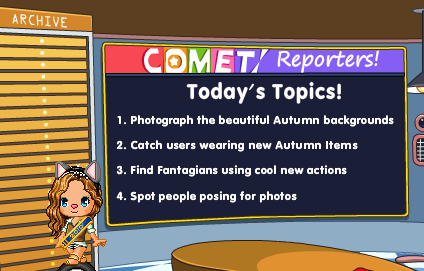 You can also upload your photos to the Fanatge Comet, and by participating, you could win a prize, or be featured in next week’s edition! 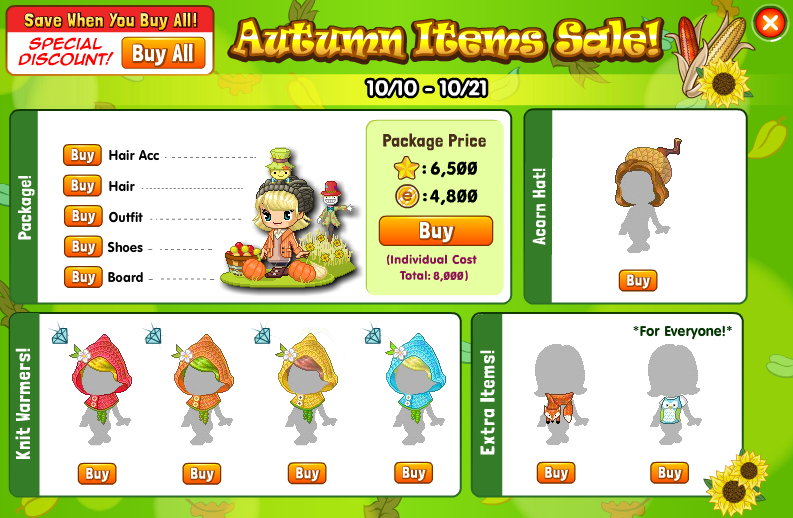 Fantage has released some new actions to give a bit of change to just the old jump, wink. wave, cry. (Only the 90’s kids remember this). 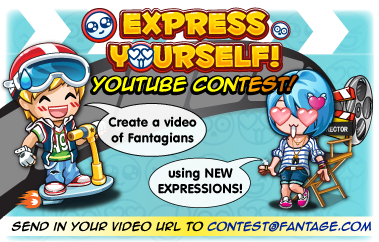 And if you create a youtube video using the new expressions in some way, you could wind the contest, as well as prizes. The Golden Pumpkin: (Two different kinds. An actual gold one, and the small orange one) Both are for Premium Members only. 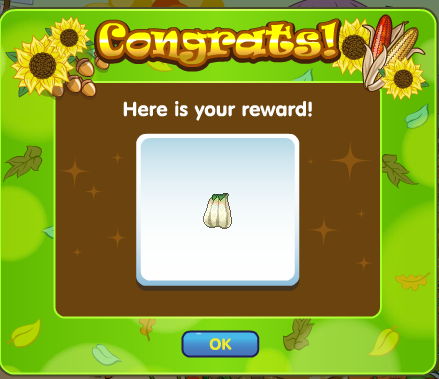 You can keep switching pumpkins to get the different prizes, or if you change your mind, until the event ends. 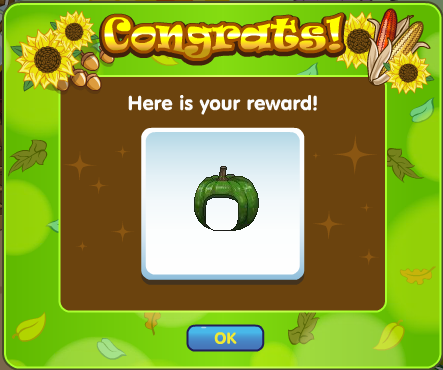 When the Halloween event comes next week, that pumpkin will be the one you will be able to carve and turn into a jack-o-lantern. Well, Have fun guys and try not to dawn too much on the fact that Trade and Sell is closing soon…. (Only the 90′s kids remember this). Like it so far, but you should make it more interesting and keep it updated and kept up. Also add chats, tips, tricks, and secret places to make everyone love this blog. 🙂 Don’t you think it’s a bit boring? I mean, we could just look on Fantage, right? Why bother to look for this page? Love it, though! Ive working on that. For this holiday event, Im adding a bunch of tips on ticket collecting and I’m trying to add in some other cool things. Thank You!